qpictopdf will convert one or many pictures into one pdf file. The picture(s) can be easily selected in a tree view. It uses convert from ImageMagick to concatenate 2 images into 1 and then create 1 pdf file from the image(s). Please note, that there is no option to scale to a specific page size. Pictures are turned into a pdf page as is, with whatever size they originally have. The program is designed for archiving purposes - re-viewing on screen, not creating printable pages. As of version 0.9.90 qpictopdf also supports to concatenating 2 pictures into 1, horizontally or vertically. Careful, files are really deleted from disk (after confirmation)! 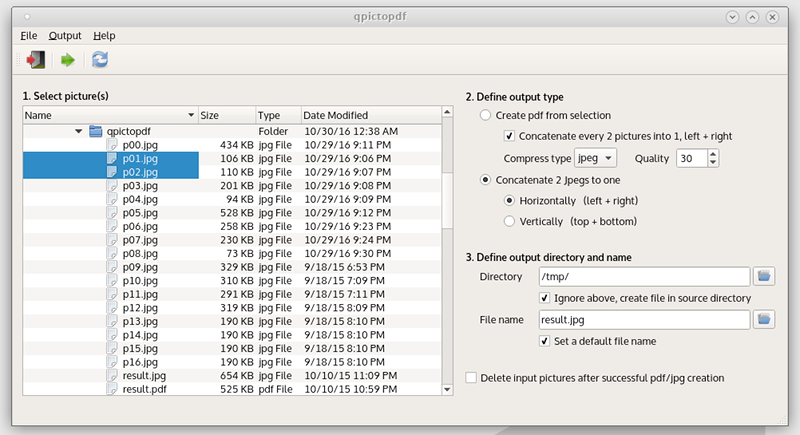 qpictopdf uses cmake, Qt5 and calls convert from ImageMagick via QProcess. Beside the source, an inofficial arch linux package for amd64 is available.